If you are not quite ready to take the plunge and be a homeowner, yet you are discouraged and underwhelmed by all those rental homes that were made “for other people”, you absolutely must see this place! 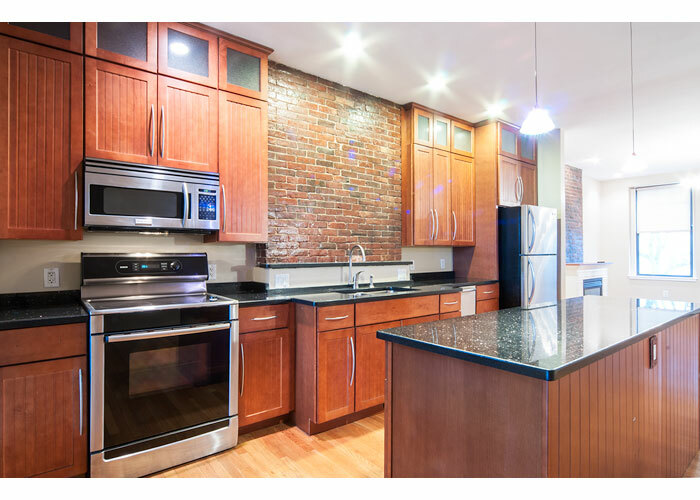 You will never get that feeling here because the landlord did a stunning gut renovation with the intention to live in it so it is an owner occupied, condo quality home, unlike so many of the standard rentals out there. The minute you walk in the door, you will instantly be impressed. The entry way has original mosaic tastefully restored by the owner and the attention to detail continues into the spacious, open layout of the living and dining space. There is a working fireplace, hardwood floors and exposed brick that gives the space a unique and authentic feel. The sun-splashed kitchen with an extraordinary island, granite counter tops, stainless steel appliances, pendant and recessed lighting is every cook’s dream come true. Relaxing with a glass of wine will likely become your favorite thing to do since there is a fabulous private deck with absolutely amazing views of the Boston skyline. This condo has 2 full bathrooms, one offers a standing shower while the master bath has a Bain Ultra jet tub and crystal double sinks and of course there is a washer/dryer in the unit. Be amazed by this bi-level 1400 sq. ft custom made condo on a tree lined street with brownstones and historical houses in the neighborhood where the residents are friendly and the community is thriving. Great neighborhood restaurants nearby, easy access to all the major highways, less than 10 minutes to Downtown by train and plenty of easy street parking. Just when you thought this place doesn’t get any better, I will tell you that your pets are welcome here too! Don’t wait – see this treasure today!